Zeus Arc VS DaVinci IQ : Innovative Features or Pure Power? Who Wins? Here, we will go over some of the most commonly asked about features, such as heating, discreetness, ease of use, vapor quality, battery, cleaning, and so on. Both of these devices are solid and tend to be worth the money. Both of these units use conduction heating, are shaped similarly and are designed exclusively for use with dry herbs. But in the end, there can be only one! Read on to find out which unit is the winner. Both the Zeus Arc and the DaVinci IQ are attractive looking and discreet. They fit comfortably in your palm with ease and neither really even resembles what most people would think a portable vaporizer looks like. They kind of look like a battery pack or a beeper, if you have been around long enough to remember what beepers are. Even though both of these units are discreet and easily palmed, the Arc wins this round because it doesn’t have any hinges like the IQ does. The hinges that you open to access the chamber can deteriorate over time through normal wear and tear, and are made worse if you drop it. Additionally, the Arc has a flat part in the middle which means holding it is more comfortable than the IQ, which is round. Both devices use conduction heating and they both have an included multi-tool. We still give the edge to the Zeus Arc in the first round because it feels better in your hand, the vapor quality and thickness is better, and there aren’t concerns of breakable parts. The IQ features two distinct temperature modes – smart path mode and precision mode. The smart path mode gradually increases the heat within one of four temperature ranges. This is great if you don’t know your ideal heat setting. The precision mode on the IQ is exactly as it sounds, just press the up or down buttons to select your temperature. The boost feature is helpful as well, and will give you an extra boost of heat if the smart path is going to slowly. There is also an available smartphone app with the IQ, which the Arc does not have. 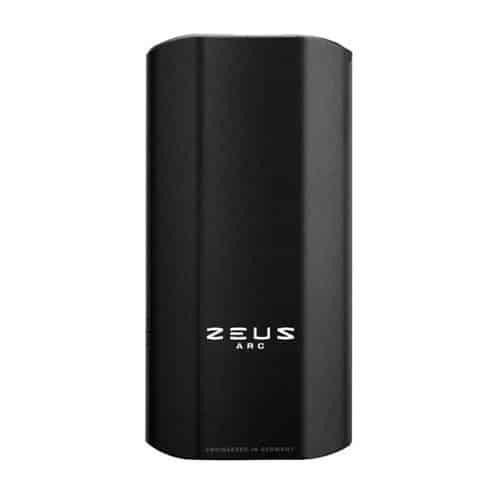 The Zeus Arc, on the other hand, is about simple to use as any portable vaporizer on the market. There is no app, no digital display, and no modes to try to understand. The Arc has three preset temperature settings: 212C, 221C, and 230C. Each of the three settings is calibrated perfectly depending on your vaping preference, with the highest setting producing some thick clouds. Round two ends in a tie. We can’t really call a winner, because it comes down to subjectivity and personal preference. If you like your vapes with innovative temp features, you might opt for the IQ. But if you want a straightforward, powerful unit, the Arc is the better choice for you. Both of these units heat herbs evenly and efficiently using conduction heating, but the Arc does seem to give you better flavor and bigger clouds. After we finished up a session with the Arc, the debris from the vaped herb was a dark brown color, which we’ve not really ever seen before with other units. That tells us that the Arc is both powerful and efficient. In fact, the Arc produces such thick clouds, it can quickly fill up the lungs of even the most experienced vaporizer lover. The vapor path of the Zeus Arc GT version is gold plated, so that does give it a rather luxurious and posh feel. Since gold is the best conductor, heat is more easily transferred in the oven, producing thicker, more flavorful vapor. The standard version of the Arc comes with a stainless steel vapor path. The IQ is made from ceramic zirconia, which to its credit, does cool off faster and is ever so slightly easier to keep clean. The IQ does give you some tasty vapor, but the Zeus Arc GT has the advantage here overall. Round three ends in favor of the Arc. Both of these units last for about 90 minutes of continuous usage. While the IQ takes about 3 hours to charge, the Arc takes about 2. That hour difference in charging time aside, round four has to go to the IQ because its battery is replaceable. You simply do not get that option with the Arc. There is a noticable difference keeping the IQ clean compared to the Arc. The IQ is noticeably more difficult to maintain cleanliness than the Arc. This is due to a gap between the flavor chamber and the oven. This is a flaw in design and build quality because that gap tends to get clogged up with residue and will restrict airflow. This is also an issue with the opening of the flavor chamber. You won’t have that same issue with the Arc. For this reason, the Zeus Arc wins round 5. As both of our contestants have exchanged heavy blows and each one has put up a respectable fight, our 6th and final round is based on warranties. The DaVinci IQ an impressive 10-year warranty, while the Zeus Arc comes with a 3-year warranty. A warranty of 3-years is solid, but obviously the IQ wins this one. While the DaVinci IQ is certainly a quality unit, and fought valiantly, we have to give the Zeus Arc GT the relatively narrow edge on this one. The IQ does have a plethora of features, a longer warranty and a replaceable battery. However, the ease of use, comfortable feel and the high quality vapor taste and production put the Zeus Arc ahead. Either way, most people we’ve heard from seem to be satisfied with the purchases they’ve made, be it the Arc or the IQ. We hope this article helps make up your mind about which of these two quality devices to purchase. Still looking for more in depth info? Be sure to check out our individual reviews on both the Zeus Arc and the DaVinci IQ. We also did a YouTube video on this exact same subject, in case you’d like some added visuals! Which of these two units do you think is superior? Let us know what you think! Follow our Facebook, Twitter, YouTube and Instagram pages and signup for our Newsletter to receive more news, updates and promotions. You could even win a prize! Check back right here to Tools42 often because we update our pages frequently. Until next time, it’s 4:20 somewhere! Happy vaping!